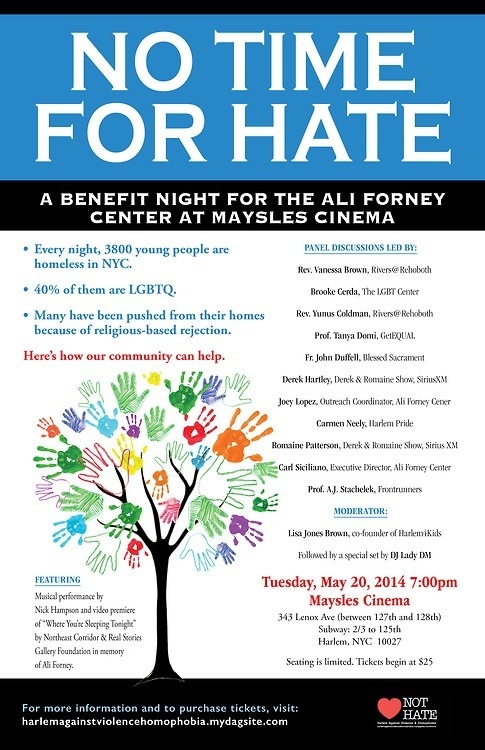 Attend No Time For Hate: May 20th Benefit for the Al Forney Center in Harlem | HarlemGal Inc.
Harlem parents have come together to host “No Time for Hate: A Benefit Night for the Ali Forney Center at Maysles Cinema” in Harlem on May 20th. All proceeds will benefit the Ali Forney Center, a Harlem-based nonprofit that serves the LGBTQ homeless youth. This entry was posted in Community, education, Events, Harlem, Harlem bloggers, Harlem blogs, HarlemGal, kids, Things to do in Harlem and tagged Ali Forney Center, Harlem, Maysles Cinema. Bookmark the permalink.